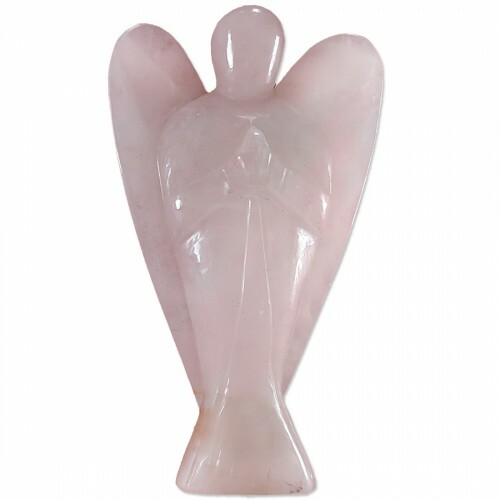 Brand: Astro-Ruchi "Messenger Of Stars"
Ratnatraya Rose Quartz Angel Sphere is made of Rose Quartz Crystal. Rose Quartz has a very fitting name, as this opaque crystal is colored with a delicate pink hue, almost glowing from within. Known as the "love stone," this crystal excels at fortify..
Ratnatraya Rose Quartz Angel Sphere is made of Rose Quartz Crystal. Rose Quartz has a very fitting name, as this opaque crystal is colored with a delicate pink hue, almost glowing from within. Known as the "love stone," this crystal excels at fortifying relationships, dispelling negativity and creating a calm atmosphere. This crystal makes a super thoughtful gift for a partner or friend. Whether as a wedding gift or even as an apology, this is a great one for all things related.